Emboldened disembodied voice! Hello again! Hi! I thought I needed to come around to make you talk about your tattoo. You mean this old thing? Why didn't you tell us beforehand? Why did you keep it a surprise? Well, I didn't want to make it a complete surprise. That's why I made those little teaser posts. I didn't just want to come out and say "HAI GUYZ I GOTS TEH TATOOO LULZ! ", but at the same time, I wanted to keep it fun and surprising. Fair enough. But what about your parents? Were you doing this behind their backs, as an act of youthful aggression? Actually, they were the first people I told, er asked for permission. I respect my parents more than you think, Voice. I wasn't trying to be rebellious, just expressive. That brings me to my next point: why the Hell would you want a tattoo? *Shrugs* I've wanted one for a while now. No, it's true. 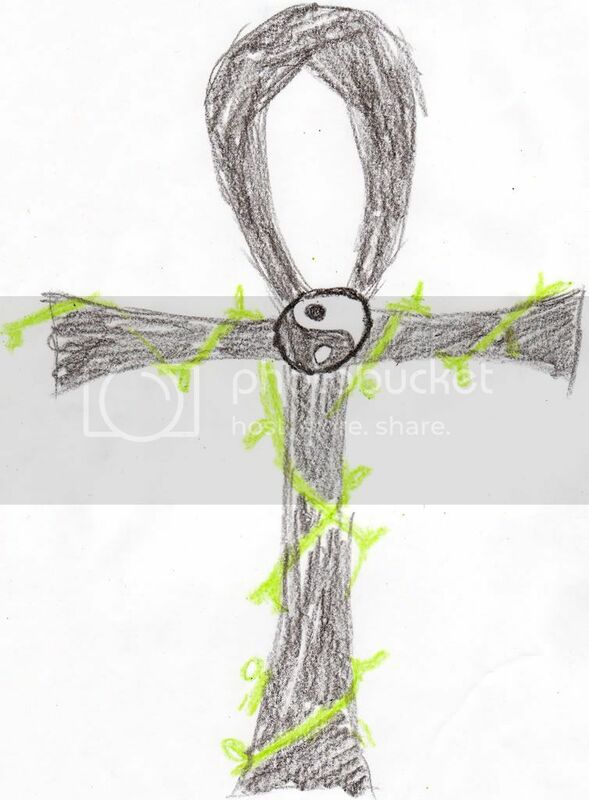 In fact, my early rendering of the design was drawn in my freshman year of high school. Yes. In fact, I still have it. Wow, so you really have had this in your mind for seven years? (That one was done in crayon, if you can't tell.) Other variations had the Chinese/Japanese symbols for "Faith," "Hope," "Love," and "Will" in each of the four quadrants. 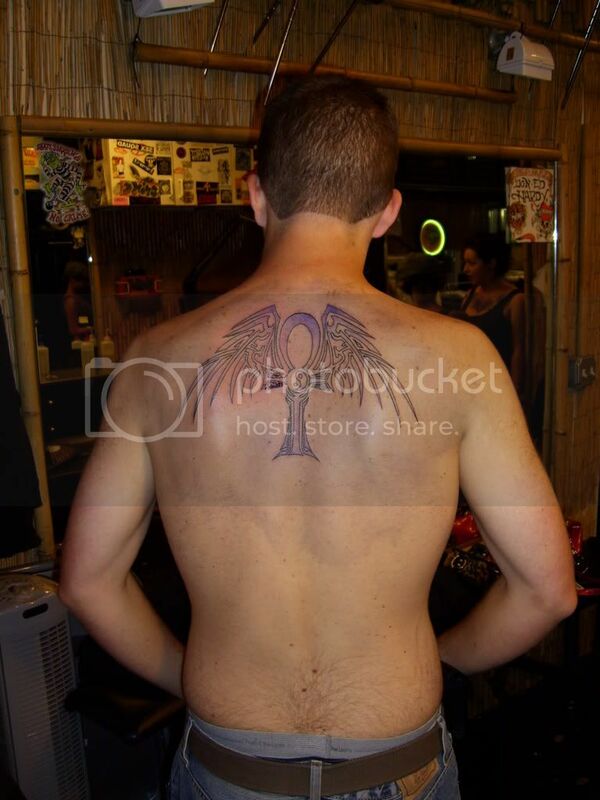 But you ended up going with angel wings...? I like angels. 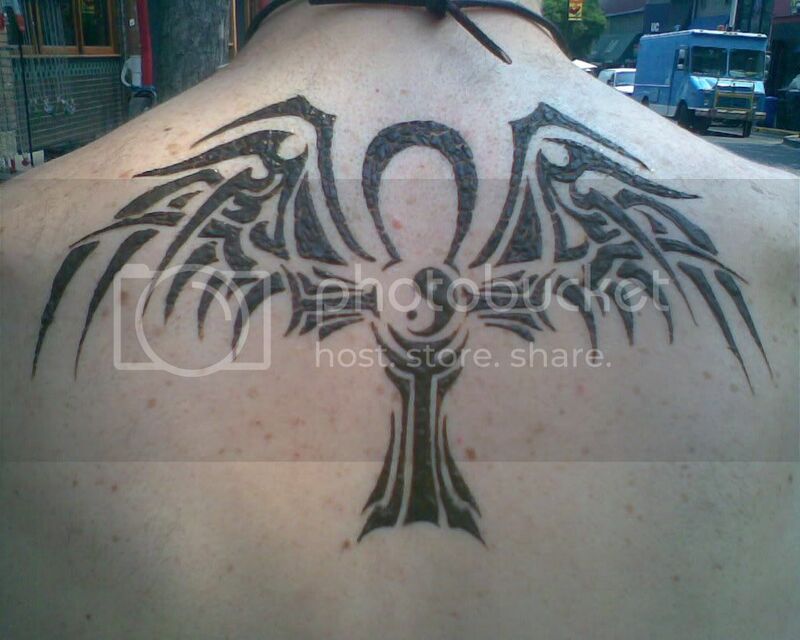 And wings go well on the back. 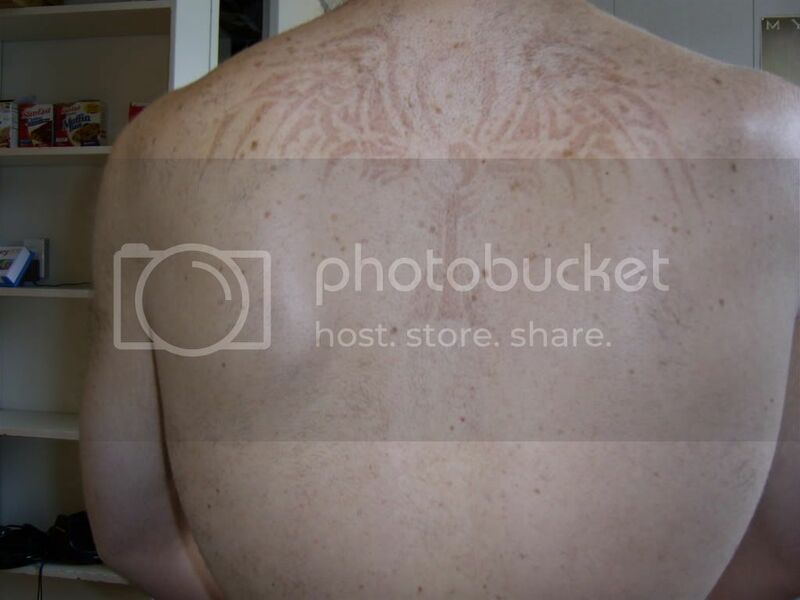 So you were always planning on having this on your back. From the very start. And I always meant for it to be big. Quite big. If you're going to go for it, I thought, go for it. Well, the back is a place that I can look at when I want to, and not look at when I don't want to. Should there ever be a day I totally regret it, I just need to make sure not to buy a three-way mirror. Plus, unless I have one of the most awkward interviews ever, it can't possibly hurt my ability to get a job. Okay, back to the design. What's so special about this symbol? Does it mean something? "It's basically a combination of symbols of unity and balance. 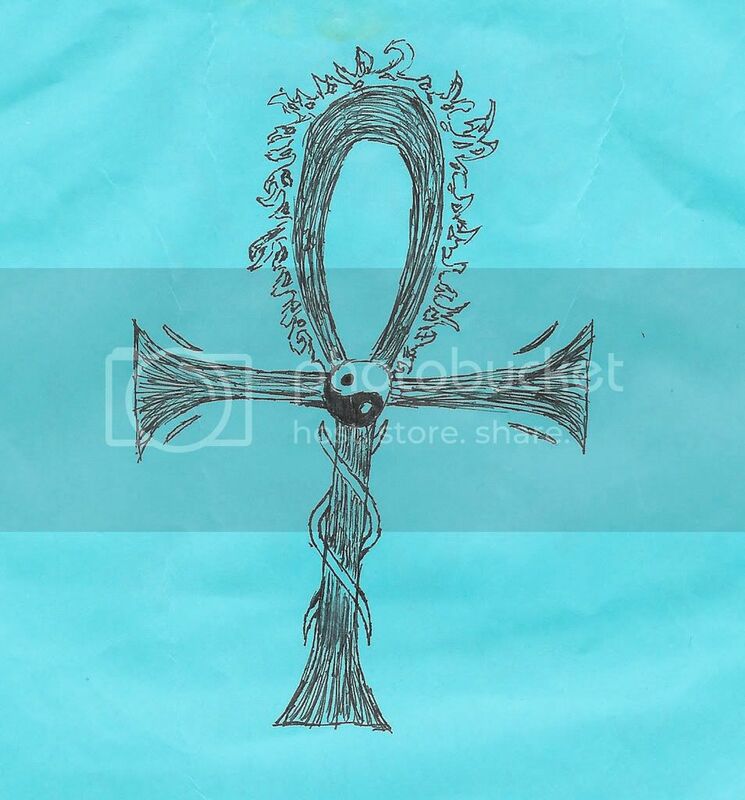 The Ankh: Itself a symbol of unity/balance between the male & female, masculine & feminine, this was a symbol used by the ancient Egyptians 5,000 years ago. Since then, it has been adopted into other belief systems, most prominently Christianity, which I see as a union between the Old and the New. The Yin-Yang: Obviously, a symbol of the balance between light & dark, good & evil, passive & aggressive, and every other pair of opposites you can think of. 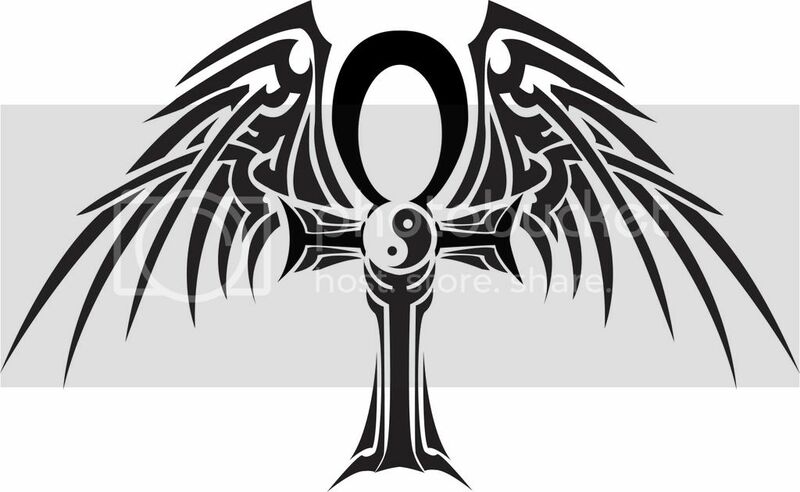 The fact that it is at the crux of the ankh is to show a union between East & West. The Wings: I am a big fan of angels. And I've always thought that this kind of perfect balance and unity is what separates the angels from humans." Okay, truth be told, the very last line on there was a retrofitting of the description. The wings began mostly as a flourish, but in the end, they make it look better. Well, you couldn't have made the final design yourself. No offense, but your early drawings aren't exactly...good. -I did not like the first wings; or rather, they wouldn't work for my purposes. They look too much like faerie or even demon wings (which was the exact opposite of what I was going for). The second pair of wings was much more too my liking. -I'm a symmetry whore. I looooove symmetry. 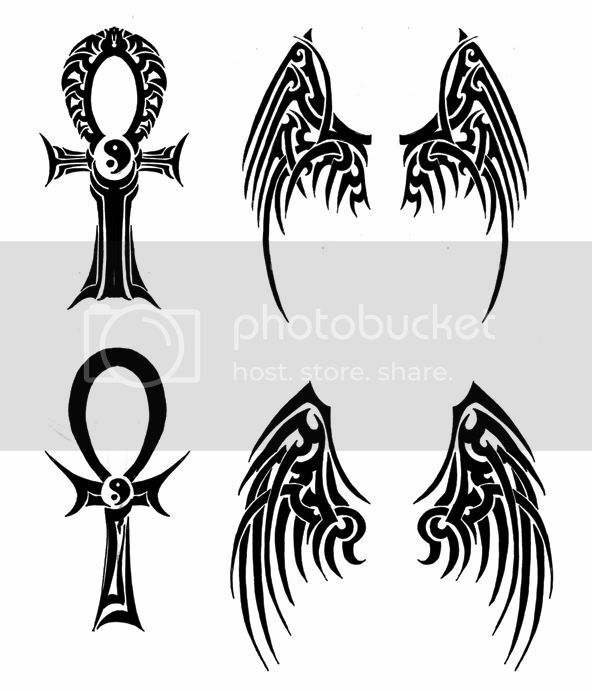 That's why the first ankh stood out to me so much more than the second one. However, I wasn't much too fond of the head/hoop. Too busy; almost looks like a lion's mane. And when you combine it with the wings, it definitely doesn't work. So time when on, and I got another version of the "final" sketch, but there was something I wasn't too hot-to-trot about: the wings were too enclosed, too relaxed. I felt they needed to be spread out a little more. The artist tried various ways (I didn't like the second one; looks too much like claws), but in the end, we finally settled for what was essentially a final design (minus some ever-so-slight adjustments). And that was that! Okay, so you then got it done! Not so fast, buster. This is a major thing; I wasn't going to do it immediately. I actually waited a month before even telling my parents, and then an additional month before I got the tattoo in henna. Yes, henna. It's really useful for getting a good idea of what the final product is. And when you live in Berkeley, there are several henna artists around campus. So, I went to one. And I ended up with this: Because it was made with a goop, it ended up kinda scabby. But you have to admit, this looks pretty good for being done by hand. And after a week with it (and after the scabby goop fell off and left me with a birthmark-like impression), I decided that I would get it. And you did right then and there? Nope, it took another two weeks before I even made the appointment. I went to a place called Zebra. It's a pretty famous, popular place. It had also been named "Best of the Bay" by the SF Guardian one year, so it's pretty legitamite. I ended up choosing a tattoo artist named Sonju, who had over 11 years of experience. So I was in good hands. So, how long did it take to get it done? Yes. I'll be honest; it hurt quite a bit. It felt like someone was pinching me with their sharp fingernails, and then dragging it along the skin. But the thing was, it was a very ephemeral pain. When they took the needle off my back, no problem. But when it was on (especially for the fill-in), hoo-boy! What did you do to cope with the pain? Most effective: breathing. Focusing on my breathing, and nothing else. I do. Here's me with the outline but not the fill-in. If you look closely, you can see some blood in the arm on the left. Here's me with the bandage on afterward. I'm not exactly sure if that red stuff near the bottom is blood or just the goop they put on afterward. Here's the first picture with the bandage off. 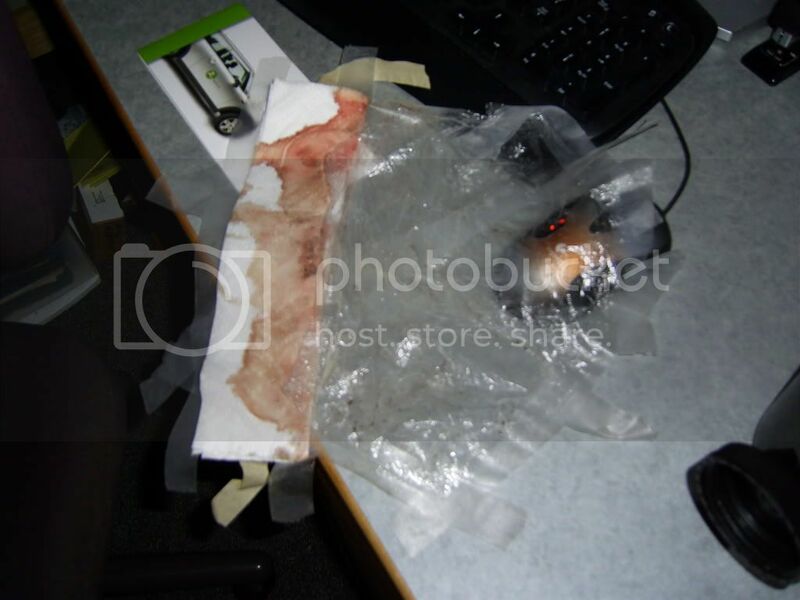 And here's the picture of the bandage itself. Soo, how are you feeling about it now, a week later? Good. It's healing pretty nicely so far, and I've been taking good care of it. And I still like the look of it. So that's good. And the majority of reaction I've gotten has been positive. So that's good. Okay. 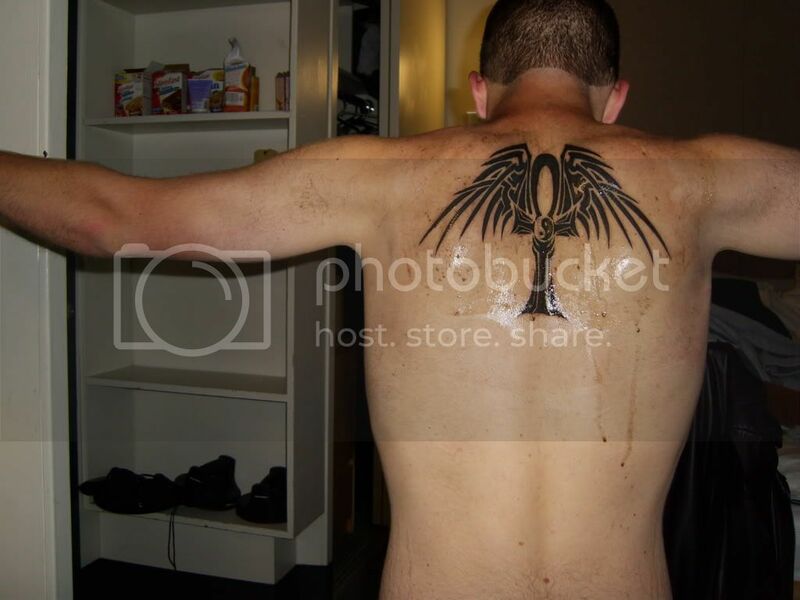 How much did this good tatoo cost? It was hourly, so it ended up being around $350. But when you're dealing with your body, you should be willing to pay the monetary price now to avoid the non-monetary price later. Good point. Now last question: you've gotten one; are you going to get any more? If I ever did, it won't be for a while. I see. Well, that's all I have. A pleasure to see you again, emboldened disembodied voice! Bye bye! Thanks for the nice recap of your new tatoo. It's interesting to see your extended thought process and steps involved with this major addition to your body. Wow, I didn't realize this was such a long-going process. Hell, I think you've showed me the design back in SA. Regardless - this is very cool and even though I probably would never do anything like it, I applaud you and your art.